"Thoreau" redirects here. For other uses, see Thoreau (disambiguation). Henry David Thoreau (born David Henry Thoreau; July 12, 1817– May 6, 1862) was an American author, poet, abolitionist, naturalist, tax resister, development critic, surveyor, historian, philosopher, and leading transcendentalist. He is best known for his book Walden, a reflection upon simple living in natural surroundings, and his essay, Civil Disobedience, an argument for individual resistance to civil government in moral opposition to an unjust state. Thoreau's books, articles, essays, journals, and poetry total over 20 volumes. Among his lasting contributions were his writings on natural history and philosophy, where he anticipated the methods and findings of ecology and environmental history, two sources of modern day environmentalism. His literary style interweaves close natural observation, personal experience, pointed rhetoric, symbolic meanings, and historical lore; while displaying a poetic sensibility, philosophical austerity, and "Yankee" love of practical detail. He was also deeply interested in the idea of survival in the face of hostile elements, historical change, and natural decay; at the same time imploring one to abandon waste and illusion in order to discover life's true essential needs. He was a lifelong abolitionist, delivering lectures that attacked the Fugitive Slave Law while praising the writings of Wendell Phillips and defending abolitionist John Brown. Thoreau's philosophy of civil disobedience influenced the political thoughts and actions of such later figures as Leo Tolstoy, Mahatma Gandhi, and Martin Luther King, Jr.
Thoreau is sometimes cited as an individualist anarchist. Though Civil Disobedience seems to call for improving rather than abolishing government– "I ask for, not at once no government, but at once a better government"– the direction of this improvement aims at anarchism: "'That government is best which governs not at all;' and when men are prepared for it, that will be the kind of government which they will have." Charles Madison describes his seemingly anarchist comments as "obviously the hyperbole of the advocate" and opines that Thoreau was too wise a philosopher to condone anarchy. Richard Drinnon partly blames Thoreau for the ambiguity, noting that Thoreau's "sly satire, his liking for wide margins for his writing, and his fondness for paradox provided ammunition for widely divergent interpretations of 'Civil Disobedience.'" He further points out that although Thoreau writes that he only wants "at once" a better government, that does not rule out the possibility that a little later he might favor no government. He was born David Henry Thoreau in Concord, Massachusetts, to John Thoreau (a pencil maker) and Cynthia Dunbar. His paternal grandfather was of French origin and was born in Jersey. His maternal grandfather, Asa Dunbar, led Harvard's 1766 student "Butter Rebellion", the first recorded student protest in the Colonies. David Henry was named after a recently deceased paternal uncle, David Thoreau. He did not become "Henry David" until after college, although he never petitioned to make a legal name change. He had two older siblings, Helen and John Jr., and a younger sister, Sophia. Thoreau's birthplace still exists on Virginia Road in Concord and is currently the focus of preservation efforts. The house is original, but it now stands about 100 yards away from its first site. Amos Bronson Alcott and Thoreau's aunt each wrote that "Thoreau" is pronounced like the word "thorough", whose standard American pronunciation rhymes with "furrow". Edward Emerson wrote that the name should be pronounced "Th-row, the h sounded, and accent on the first syllable." In appearance he was homely, with a nose that he called "my most prominent feature." Of his face, Nathaniel Hawthorne wrote: "[Thoreau] is as ugly as sin, long-nosed, queer-mouthed, and with uncouth and rustic, though courteous manners, corresponding very well with such an exterior. But his ugliness is of an honest and agreeable fashion, and becomes him much better than beauty." Thoreau also wore a neck-beard for many years, which he insisted many women found attractive. However, Louisa May Alcott mentioned to Ralph Waldo Emerson that Thoreau's facial hair "will most assuredly deflect amorous advances and preserve the man's virtue in perpetuity." 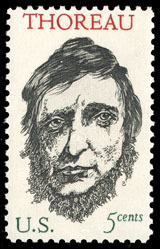 Thoreau studied at Harvard University between 1833 and 1837. He lived in Hollis Hall and took courses in rhetoric, classics, philosophy, mathematics, and science. A legend proposes that Thoreau refused to pay the five-dollar fee for a Harvard diploma. In fact, the master's degree he declined to purchase had no academic merit: Harvard College offered it to graduates "who proved their physical worth by being alive three years after graduating, and their saving, earning, or inheriting quality or condition by having Five Dollars to give the college." His comment was: "Let every sheep keep its own skin", a reference to the tradition of diplomas being written on sheepskin vellum. 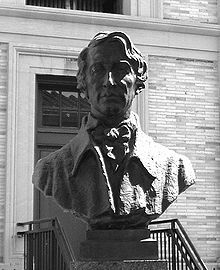 The traditional professions open to college graduates–law, the church, business, medicine–failed to interest Thoreau, :25 so in 1835 he took a leave of absence from Harvard, during which he taught school in Canton, Massachusetts. After he graduated in 1837, he joined the faculty of the Concord public school, but resigned after a few weeks rather than administer corporal punishment. :25 He and his brother John then opened a grammar school in Concord in 1838 called Concord Academy. :25 They introduced several progressive concepts, including nature walks and visits to local shops and businesses. The school ended when John became fatally ill from tetanus in 1842 after cutting himself while shaving. He died in his brother Henry's arms. 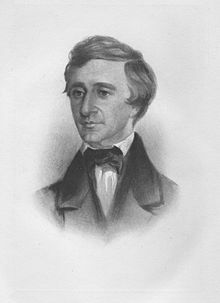 Upon graduation Thoreau returned home to Concord, where he met Ralph Waldo Emerson. Emerson took a paternal and at times patronizing interest in Thoreau, advising the young man and introducing him to a circle of local writers and thinkers, including Ellery Channing, Margaret Fuller, Bronson Alcott, and Nathaniel Hawthorne and his son Julian Hawthorne, who was a boy at the time. Emerson urged Thoreau to contribute essays and poems to a quarterly periodical, The Dial, and Emerson lobbied editor Margaret Fuller to publish those writings. Thoreau's first essay published there was Aulus Persius Flaccus, an essay on the playwright of the same name, published in The Dial in July 1840. It consisted of revised passages from his journal, which he had begun keeping at Emerson's suggestion. The first journal entry on October 22, 1837, reads, "'What are you doing now?' he asked. 'Do you keep a journal?' So I make my first entry to-day." Thoreau was a philosopher of nature and its relation to the human condition. In his early years he followed Transcendentalism, a loose and eclectic idealist philosophy advocated by Emerson, Fuller, and Alcott. They held that an ideal spiritual state transcends, or goes beyond, the physical and empirical, and that one achieves that insight via personal intuition rather than religious doctrine. In their view, Nature is the outward sign of inward spirit, expressing the "radical correspondence of visible things and human thoughts," as Emerson wrote in Nature (1836). Thoreau returned to Concord and worked in his family's pencil factory, which he continued to do for most of his adult life. He rediscovered the process to make a good pencil out of inferior graphite by using clay as the binder; this invention improved upon graphite found in New Hampshire and bought in 1821 by relative Charles Dunbar. (The process of mixing graphite and clay, known as the Cont process, was patented by Nicolas-Jacques Cont in 1795). His other source had been Tantiusques, an Indian operated mine in Sturbridge, Massachusetts. Later, Thoreau converted the factory to produce plumbago (graphite), which was used to ink typesetting machines. Once back in Concord, Thoreau went through a restless period. In April 1844 he and his friend Edward Hoar accidentally set a fire that consumed 300 acres (1.2 km2) of Walden Woods. He spoke often of finding a farm to buy or lease, which he felt would give him a means to support himself while also providing enough solitude to write his first book. Thoreau embarked on a two-year experiment in simple living on July 4, 1845, when he moved to a small, self-built house on land owned by Emerson in a second-growth forest around the shores of Walden Pond. The house was not in wilderness but at the edge of town, 1.5 miles (2.4 km) from his family home. Heard Thoreau's lecture before the Lyceum on the relation of the individual to the State– an admirable statement of the rights of the individual to self-government, and an attentive audience. His allusions to the Mexican War, to Mr. Hoar's expulsion from Carolina, his own imprisonment in Concord Jail for refusal to pay his tax, Mr. Hoar's payment of mine when taken to prison for a similar refusal, were all pertinent, well considered, and reasoned. I took great pleasure in this deed of Thoreau's. Thoreau revised the lecture into an essay entitled Resistance to Civil Government (also known as Civil Disobedience). In May 1849 it was published by Elizabeth Peabody in the Aesthetic Papers. Thoreau had taken up a version of Percy Shelley's principle in the political poem The Mask of Anarchy (1819), that Shelley begins with the powerful images of the unjust forms of authority of his time– and then imagines the stirrings of a radically new form of social action. At Walden Pond, he completed a first draft of A Week on the Concord and Merrimack Rivers, an elegy to his brother, John, that described their 1839 trip to the White Mountains. Thoreau did not find a publisher for this book and instead printed 1,000 copies at his own expense, though fewer than 300 were sold. :234 Thoreau self-published on the advice of Emerson, using Emerson's own publisher, Munroe, who did little to publicize the book. Its failure put Thoreau into debt that took years to pay off, and Emerson's flawed advice caused a schism between the friends that never entirely healed. In August 1846, Thoreau briefly left Walden to make a trip to Mount Katahdin in Maine, a journey later recorded in "Ktaadn," the first part of The Maine Woods. Thoreau left Walden Pond on September 6, 1847.:244 Over several years, he worked to pay off his debts and also continuously revised his manuscript for what, in 1854, he would publish as Walden, or Life in the Woods, recounting the two years, two months, and two days he had spent at Walden Pond. The book compresses that time into a single calendar year, using the passage of four seasons to symbolize human development. Part memoir and part spiritual quest, Walden at first won few admirers, but today critics[who?] regard it as a classic American work that explores natural simplicity, harmony, and beauty as models for just social and cultural conditions. In 1851, Thoreau became increasingly fascinated with natural history and travel/expedition narratives. He read avidly on botany and often wrote observations on this topic into his journal. He admired William Bartram, and Charles Darwin's Voyage of the Beagle. He kept detailed observations on Concord's nature lore, recording everything from how the fruit ripened over time to the fluctuating depths of Walden Pond and the days certain birds migrated. The point of this task was to "anticipate" the seasons of nature, in his words. He became a land surveyor and continued to write increasingly detailed natural history observations about the 26 square miles (67 km2) township in his journal, a two-million word document he kept for 24 years. He also kept a series of notebooks, and these observations became the source for Thoreau's late natural history writings, such as Autumnal Tints, The Succession of Trees, and Wild Apples, an essay lamenting the destruction of indigenous and wild apple species. Until the 1970s, literary critics[who?] dismissed Thoreau's late pursuits as amateur science and philosophy. With the rise of environmental history and ecocriticism, several new readings[who?] of this matter began to emerge, showing Thoreau to be both a philosopher and an analyst of ecological patterns in fields and woodlots. For instance, his late essay, "The Succession of Forest Trees," shows that he used experimentation and analysis to explain how forests regenerate after fire or human destruction, through dispersal by seed-bearing winds or animals. He traveled to Quebec once, Cape Cod four times, and Maine three times; these landscapes inspired his "excursion" books, A Yankee in Canada, Cape Cod, and The Maine Woods, in which travel itineraries frame his thoughts about geography, history and philosophy. Other travels took him southwest to Philadelphia and New York City in 1854, and west across the Great Lakes region in 1861, visiting Niagara Falls, Detroit, Chicago, Milwaukee, St. Paul and Mackinac Island. Although provincial in his physical travels, he was extraordinarily well-read and vicariously a world traveler. He obsessively devoured all the first-hand travel accounts available in his day, at a time when the last unmapped regions of the earth were being explored. He read Magellan and Cook, the arctic explorers Franklin, Mackenzie and Parry, Darwin's account of his voyage on the Beagle, Livingstone and Burton on Africa, Lewis and Clark; and hundreds of lesser-known works by explorers and literate travelers. Astonishing amounts of global reading fed his endless curiosity about the peoples, cultures, religions and natural history of the world, and left its traces as commentaries in his voluminous journals. He processed everything he read, in the local laboratory of his Concord experience. Among his famous aphorisms is his advice to "live at home like a traveler." After John Brown's raid on Harpers Ferry, many prominent voices in the abolitionist movement distanced themselves from Brown, or damned him with faint praise. Thoreau was disgusted by this, and he composed a speech– A Plea for Captain John Brown– which was uncompromising in its defense of Brown and his actions. Thoreau's speech proved persuasive: first the abolitionist movement began to accept Brown as a martyr, and by the time of the American Civil War entire armies of the North were literally singing Brown's praises. As a contemporary biographer of John Brown put it: "If, as Alfred Kazin suggests, without John Brown there would have been no Civil War, we would add that without the Concord Transcendentalists, John Brown would have had little cultural impact." Thoreau contracted tuberculosis in 1835 and suffered from it sporadically afterwards. In 1859, following a late night excursion to count the rings of tree stumps during a rain storm, he became ill with bronchitis. His health declined over three years with brief periods of remission, until he eventually became bedridden. Recognizing the terminal nature of his disease, Thoreau spent his last years revising and editing his unpublished works, particularly The Maine Woods and Excursions, and petitioning publishers to print revised editions of A Week and Walden. He also wrote letters and journal entries until he became too weak to continue. His friends were alarmed at his diminished appearance and were fascinated by his tranquil acceptance of death. When his aunt Louisa asked him in his last weeks if he had made his peace with God, Thoreau responded: "I did not know we had ever quarreled." 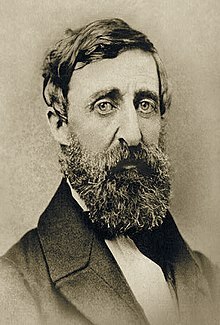 Aware he was dying, Thoreau's last words were "Now comes good sailing", followed by two lone words, "moose" and "Indian". He died on May 6, 1862 at age 44. Bronson Alcott planned the service and read selections from Thoreau's works, and Channing presented a hymn. Emerson wrote the eulogy spoken at his funeral. Originally buried in the Dunbar family plot, he and members of his immediate family were eventually moved to Sleepy Hollow Cemetery (N42– 27' 53.7" W71– 20' 33") in Concord, Massachusetts. Thoreau's friend Ellery Channing published his first biography, Thoreau the Poet-Naturalist, in 1873, and Channing and another friend Harrison Blake edited some poems, essays, and journal entries for posthumous publication in the 1890s. Thoreau's journals, which he often mined for his published works but which remained largely unpublished at his death, were first published in 1906 and helped to build his modern reputation. A new, expanded edition of the journals is underway, published by Princeton University Press. Today, Thoreau is regarded[who?] as one of the foremost American writers, both for the modern clarity of his prose style and the prescience of his views on nature and politics. His memory is honored by the international Thoreau Society. "Most of the luxuries and many of the so-called comforts of life are not only not indispensable, but positive hindrances to the elevation of mankind." Thoreau was an early advocate of recreational hiking and canoeing, of conserving natural resources on private land, and of preserving wilderness as public land. Thoreau was also one of the first American supporters of Darwin's theory of evolution. He was not a strict vegetarian, though he said he preferred that diet and advocated it as a means of self-improvement. He wrote in Walden: "The practical objection to animal food in my case was its uncleanness; and besides, when I had caught and cleaned and cooked and eaten my fish, they seemed not to have fed me essentially. It was insignificant and unnecessary, and cost more than it came to. A little bread or a few potatoes would have done as well, with less trouble and filth." On alcohol, Thoreau wrote: "I would fain keep sober always... I believe that water is the only drink for a wise man; wine is not so noble a liquor... Of all ebriosity, who does not prefer to be intoxicated by the air he breathes?" Mahatma Gandhi first read Walden in 1906 while working as a civil rights activist in Johannesburg, South Africa. He told American reporter Webb Miller, "[Thoreau's] ideas influenced me greatly. I adopted some of them and recommended the study of Thoreau to all of my friends who were helping me in the cause of Indian Independence. Why I actually took the name of my movement from Thoreau's essay 'On the Duty of Civil Disobedience,' written about 80 years ago." Here, in this courageous New Englander's refusal to pay his taxes and his choice of jail rather than support a war that would spread slavery's territory into Mexico, I made my first contact with the theory of nonviolent resistance. Fascinated by the idea of refusing to cooperate with an evil system, I was so deeply moved that I reread the work several times. I became convinced that noncooperation with evil is as much a moral obligation as is cooperation with good. No other person has been more eloquent and passionate in getting this idea across than Henry David Thoreau. As a result of his writings and personal witness, we are the heirs of a legacy of creative protest. The teachings of Thoreau came alive in our civil rights movement; indeed, they are more alive than ever before. Whether expressed in a sit-in at lunch counters, a freedom ride into Mississippi, a peaceful protest in Albany, Georgia, a bus boycott in Montgomery, Alabama, these are outgrowths of Thoreau's insistence that evil must be resisted and that no moral man can patiently adjust to injustice. The University of Michigan's New England Literature Program is an experiential literature and writing program run through the university's Department of English Language and Literature which was started in the 1970s by professors Alan Howes and Walter Clark. Howes and Clark called upon Thoreauvian ideals of nature, independence and community to create an academic program modeled after Thoreau's experiment at Walden Pond. Today, students at NELP study Thoreau's work– as well as that of several other New England writers from the 19th and 20th centuries– in relative isolation on Sebago Lake in Raymond, Maine. American psychologist B. F. Skinner wrote that he carried a copy of Thoreau's Walden with him in his youth. and, in 1945, wrote Walden Two, a fictional utopia about 1,000 members of a community living together inspired by the life of Thoreau. Thoreau inspired children's book author and illustrator D.B. Johnson to create a series of picture books based on Thoreau. The first book Henry Hikes to Fitchburg has become a bestseller. Thoreau and his fellow Transcendentalists from Concord were a major inspiration of the composer Charles Ives. The 4th movement of the Concord Sonata for piano (with a part for flute, Thoreau's instrument) is a character picture and he also set Thoreau's words. Anarchism started to have an ecological view mainly in the writings of Thoreau. In his book Walden "Many have seen in Thoreau one of the precursors of ecologism and anarcho-primitivism represented today in John Zerzan and Derrick Jensen. For George Woodcock this attitude can be also motivated by certain idea of resistance to progress and of rejection of the growing materialism which is the nature of american society in the mid XIX century." Zerzan included Thoreau's text "Excursions" (1863) in his edited compilation titled Against civilization: Readings and reflections from 1999. Anarchist and feminist Emma Goldman also appreciated Thoreau and referred to him as "the greatest American anarchist." Thoreau was an important influence on late 19th century anarchist naturism, the combination of anarchist and naturist philosophies. Mainly it had importance within individualist anarchist circles in Spain, France, and Portugal. Thoreau's ideas were not universally applauded by some of his contemporaries in literary circles. ...Thoreau's content and ecstasy in living was, we may say, like a plant that he had watered and tended with womanish solicitude; for there is apt to be something unmanly, something almost dastardly, in a life that does not move with dash and freedom, and that fears the bracing contact of the world. In one word, Thoreau was a skulker. He did not wish virtue to go out of him among his fellow-men, but slunk into a corner to hoard it for himself. He left all for the sake of certain virtuous self-indulgences. Poet John Greenleaf Whittier detested what he deemed to be the message of Walden, decreeing that Thoreau wanted man to "lower himself to the level of a woodchuck and walk on four legs." He went further to castigate the work as "very wicked and heathenish", remarking "I prefer walking on two legs." People–very wise in their own eyes–who would have every man's life ordered according to a particular pattern, and who are intolerant of every existence the utility of which is not palpable to them, may pooh-pooh Mr. Thoreau and this episode in his history, as unpractical and dreamy. Thoreau's 'Walden, or Life in the Woods' deserves its status as a great American book but let it be known that Nature Boy went home on weekends to raid the family cookie jar. While living the simple life in the woods, Thoreau walked into nearby Concord, Mass., almost every day. And his mom, who lived less than two miles away, delivered goodie baskets filled with meals, pies and doughnuts every Saturday. The more one reads in Thoreau's unpolished journal of his stay in the woods, the more his sojourn resembles suburban boys going to their tree-house in the backyard and pretending they're camping in the heart of the jungle. ^ Biography of Henry David Thoreau, American Poems (2000–2007 Gunnar Bengtsson). ^ Encyclopaedia of the Social Sciences, edited by Edwin Robert Anderson Seligman, Alvin Saunders Johnson, 1937, p. 12. ^ "Thoreau's Diploma" American Literature Vol. 17, May 1945. 174–175. ^ Walter Harding, "Live Your Own Life", Geneseo Summer Compass, 4 June 1984. Retrieved 2009-11-21. ^ a b c Robert Sattelmeyer, Thoreau's Reading: A Study in Intellectual History with bibliographical catalogue, Chapter 2, Princeton: Princeton University Press (1988). ^ Dean, Bradley P. "A Thoreau Chronology"
^ Woodlief, Ann "Henry David Thoreau"
^ a b c Cheever, Susan (2006). American Bloomsbury: Louisa May Alcott, Ralph Waldo Emerson, Margaret Fuller, Nathaniel Hawthorne, and Henry David Thoreau; Their Lives, Their Loves, Their Work. Detroit: Thorndike Press. Large print edition. p. 90. ISBN 0-7862-9521-X. ^ Salt, H.S. (1890). The Life of Henry David Thoreau. London: Richard Bentley & Son. pp. p. 69. http://books.google.com/books?id=t_0RAAAAYAAJ&pg=RA1–PA69. ^ F. B. Sanborn (ed. ), The Writings of Henry David Thoreau, VI, Familiar Letters, (Chapter 1, Years of Discipline) Boston: Houghton Mifflin & Co. (1906). ^ Conrad, Randall. (Fall 2005). "The Machine in the Wetland: Re-imagining Thoreau's Plumbago-Grinder". Thoreau Society Bulletin (253). ^ Rosenwald, Lawrence. "The Theory, Practice & Influence of Thoreau's Civil Disobedience". William Cain, ed. A Historical Guide to Henry David Thoreau. Cambridge: Oxford University Press, 2006. ^ Alcott, Bronson. Journals. Boston: Little, Brown, 1938. ^ Henry David Thoreau, "Autumnal Tints", The Atlantic Monthly (October 1862) pp. 385–402. (Reprint. Retrieved 2009-11-21. ^ Simon Critchley, The Book of Dead Philosophers, p. 181, New York: Random House (2009). ^ Packer, Barbara L. The Transcendentalists. Athens, Georgia: The University of Georgia Press, 2007: 272. ISBN 978-0-8203-2958-1. ^ Emerson, Ralph Waldo Thoreau. The Atlantic August 1862. ^ a b Cheever, Susan (2006). American Bloomsbury: Louisa May Alcott, Ralph Waldo Emerson, Margaret Fuller, Nathaniel Hawthorne, and Henry David Thoreau; Their Lives, Their Loves, Their Work. Detroit: Thorndike Press. Large print edition. p. 241. ISBN 0-7862-9521-X. ^ Hendrick, George and Oehlschlaeger,Fritz (eds.) Toward the Making of Thoreau's Modern Reputation, University of Illinois Press, 1979. ^ This quote is not found in this ref. ^ Stevenson, Robert Louis. "Henry David Thoreau: His Character and Opinions". Cornhill Magazine. June 1880. ^ Wagenknecht, Edward. John Greenleaf Whittier: A Portrait in Paradox. New York: Oxford University Press, 1967: 112. ^ Zacks, Richard. An Underground Education, Doubleday Publishing. 1997, p. 19. Dean, Bradley P. ed., Letters to a Spiritual Seeker. New York: W. W. Norton & Company, 2004. This article's use of external links may not follow Wikipedia's policies or guidelines. Please improve this article by removing excessive and inappropriate external links or by converting links into footnote references. The Thoreau Reader. The annotated works of Henry David Thoreau. Works by Henry David Thoreau at Project Gutenberg. Text and HTML. Works by Henry David Thoreau at Internet Archive. Scanned books. Scans of Thoreau's land surveys at the Concord Free Public Library. Complete holdings at the Huntington Library. "Henry David Thoreau". Find a Grave. http://www.findagrave.com/cgi-bin/fg.cgi?page=gr&GRid=1030.